The Foxp3 transcription factor is the master regulator of regulatory T cell (Treg) differentiation and function. Its activity is regulated by reversible acetylation. Using mass spectrometry of immunoprecipitated proteins, we identify three novel acetylation sites in murine Foxp3 (K31, K262, and K267) and the corresponding sites in human FOXP3 proteins. Newly raised modification-specific Abs against acetylated K31 and K267 confirm acetylation of these residues in murine Tregs. Mutant Foxp3 proteins carrying arginine substitutions at the three acetylation sites (3KR) accumulate in T cells to higher levels than wild-type Foxp3 and exert better suppressive activity in coculture experiments. Acetylation and stability of wild-type, but not mutant, Foxp3 is enhanced when cells are treated with Ex-527, an inhibitor of the NAD+-dependent deacetylase SIRT1. Treatment with Ex-527 promotes Foxp3 expression during induced Treg differentiation, enhances Foxp3 levels in natural Tregs, and prevents loss of Foxp3 expression in adoptively transferred Tregs in mice. Our data identify SIRT1 as a negative regulator of Treg function via deacetylation of three novel target sites in Foxp3. SIRT1 inhibitors strengthen the suppressive activity of Tregs and may be useful in enhancing Treg-based therapeutic approaches to autoimmune diseases or graft rejections. Regulatory T cells (Tregs) are CD4+ suppressor T cells that prevent pathological self-reactivity in the immune system (1, 2). Expression of the forkhead transcription factor Foxp3 is both essential and sufficient for the development and immunosuppressive function of Tregs (1, 2). Foxp3 positively and negatively regulates gene expression. It suppresses the production of effector cytokines, such as IL-2, IFN-γ, and IL-4, but activates the expression of IL-10 as well as cell surface-associated markers, including the high-affinity IL-2R CD25, CTLA-4, and the glucocorticoid-induced TNFR family-related gene/protein (1, 3). Although Foxp3 represses production of IL-2 in Tregs themselves, exogenous IL-2 is critical for sustained expression of Foxp3 and CD25 and for the suppressive function of Tregs (1). Two major populations of Foxp3+ Tregs exist (4). Naturally occurring CD4+CD25+Foxp3+ Tregs (nTregs) originate in the thymus, where they develop after TCR stimulation through MHC/self-peptide complex engagement, in combination with signaling through CD28 and CD25 (5). Induced Tregs (iTregs) develop in the periphery from naive CD4+ T cells, acquiring Foxp3 expression and associated suppressive functions. Generation of iTregs has been described in the GALT, spleen, lymph node, chronically inflamed tissues, and transplanted tissues (4). Suboptimal costimulation of TCR-mediated signals in combination with exposure to TGF-β is critical for the differentiation of iTregs in peripheral tissues (4). These conditions can be recapitulated in cell culture, and iTregs can be differentiated from naive CD4+ T cells in vitro. The suppressive functions of nTregs and iTregs are dependent on continuous high-level expression of Foxp3. Expression levels of Foxp3 are controlled by transcriptional and posttranscriptional events. Epigenetic modifications at the Foxp3 gene locus prevent expression of Foxp3 in non-Tregs (6, 7). DNA methylation patterns at the Foxp3 locus differ in the different subtypes of Tregs: whereas nTregs maintain relatively demethylated CpG islands at the Foxp3 locus to ensure stable Foxp3 expression, the degree of CpG demethylation and levels of Foxp3 expression are more variable in iTregs (8). So-called ex-Tregs have been detected in inflamed tissues during autoimmune conditions (9). These cells have lost Foxp3 expression and contain highly methylated CpG islands at the Foxp3 locus (9). Expression levels of Foxp3 are also controlled by reversible acetylation of the Foxp3 protein. Various cellular acetyltransferases and deacetylases have been implicated in Foxp3 acetylation/deacetylation in the past, but precise acetylation sites have not been conclusively determined. Intraperitoneal injection of trichostatin A (TSA), an inhibitor specific for class I and II histone deacetylases (HDACs), or knockout of the HDAC9 gene in mice was shown to cause an increase in number and suppressive activity of Tregs (10). In addition, acetylation levels of Foxp3 were found to be increased in CD4+CD25+ T cells isolated from TSA-treated mice (10). Foxp3 was shown to interact with the acetyltransferase Tip60 and with HDAC7, and this interaction was found necessary for the suppression of IL-2 production in Jurkat T cells (11). TCR ligation and TGF-β signaling enhanced binding of acetylated FOXP3 to the IL-2 promoter in human Tregs (12). Recent studies have also implicated the p300 acetyltransferase and the class III HDAC SIRT1 in the regulation of Foxp3 acetylation (13–15). SIRT1 is one of seven mammalian homologs of the yeast transcriptional repressor silent information regulator 2 (sir2), an important regulator of aging in yeast (16). Like sir2, SIRT1 is an NAD+-dependent HDAC with many nonhistone targets, including transcription factors NF-κB, p53, and Foxo proteins (16). Deacetylation by SIRT1 modulates the catalytic activity of substrate proteins as well as protein stability and protein–protein interactions, thereby participating in many important cellular responses such as cell cycle, senescence, apoptosis, inflammation, and stress responses (16–18). In the immune system, SIRT1 functions as a negative regulator of CD4+ T cell activation by repressing the proinflammatory activity of the transcription factor NF-κB, and this negative regulatory function was antagonized by the viral Tat protein during HIV infection (19). In mice, SIRT1 suppresses activation and proliferation of CD4+ effector T cells through deacetylation and inactivation of AP-1 transcription factors (20). To gain insight into the physiological role of Foxp3 acetylation, we used mass spectrometry to determine acetylation sites in the cellular Foxp3 protein. We identify three novel lysine residues that are targets of the deacetylase activity of SIRT1. We performed detailed in vitro and in vivo studies and show that these sites regulate the stability of the Foxp3 protein, thus directly influencing the suppressive function of Tregs. 293T and Jurkat cells were cultured in DMEM and RPMI media containing 10% FBS and 1% penicillin/streptomycin (v/v), respectively. Primary mouse T cells were cultured in RPMI 1640 media containing 50 μM 2-ME, 1% penicillin/streptomycin (v/v), 2 mM HEPES, and 10% FBS (v/v), all at 37°C in a 5% CO2-humidified incubator. Mutant constructs for Foxp3 acetylation sites were generated by site-directed mutagenesis with FLAG-tagged Foxp3 as a template. The FLAG-tagged Foxp3 deletion constructs and AML1/Runx1 were kindly provided by S. Sakaguchi (Kyoto University), the pSico-GFP plasmids by T. Jacks (Massachusetts Institute of Technology), and the murine stem cell virus (MSCV)- internal ribosome entry site (IRES)-Thy1.1 construct by J. Bluestone (University of California, San Francisco). To determine target acetylation sites of Foxp3, cellular Foxp3 was prepared in 293T cells. Mouse and human FLAG-Foxp3 were expressed in 293T cells by transient transfection and immunoprecipitated by anti-FLAG agarose. Foxp3 proteins were released from beads by incubating with excessive FLAG peptides. Eluted Foxp3 protein was resolved in SDS-PAGE gels, and Foxp3 bands were excised from the gel for analysis. Tryptic digestions and extractions were performed as described with adaptation to the volume of the gel plugs (21). After extraction, the samples were vacuum dried and dissolved in 0.1% trifluoroacetic acid by sonication for 15 min. Peptide separation was achieved using a nanoAcquity UPLC system (Waters, Eschborn, Germany). Briefly, peptides were trapped on a nanoAcquity C18 column, 180 mm × 20 mm, particle size 5 μm (Waters). The liquid chromatography separation was performed at a flow rate of 400 nl/min on a BEH 130 C18 column, 100 mm × 100 μm, particle size 1.7 μm (Waters). The following linear gradient was applied: from 0–4% B in 1 min, from 4–30% B in 80 min, from 30–45% B in 10 min, from 45–90% B in 10 min, 10 min at 90% B, and from 90–0% B in 0.1 min. Solvent A contained 98.9% water, 1% acetonitrile, and 0.1% formic acid; solvent B contained 99.9% acetonitrile and 0.1% formic acid. The nanoAcquity UPLC system (Waters) was coupled online to an LTQ Orbitrap XL mass spectrometer (Thermo Fisher Scientific, Waltham, MA). Electrospray ionization was achieved using a PicoTip Emitter Silica Tip (New Objective, Woburn, MA) and a spray voltage of 1.7 kV. Data-dependent acquisition using Xcalibur 2.0.6 (Thermo Fisher Scientific) was performed by one FTMS scan with a resolution of 60,000 and a range from 370–2000 m/z in parallel with six tandem mass spectrometry scans of the most intense precursor ions in the ion trap. The .mgf files were used for database searches with the MASCOT search engine (Matrix Science, London, U.K.) against the NCBInr database. The peptide mass tolerance for database searches was set to 5 ppm and fragment mass tolerance to 0.6 Da. Carbamidomethylation of C was set as a fixed modification. Variable modifications included oxidation of M and acetylation at K. Two missed cleavage sites were allowed in case of incomplete trypsin hydrolysis. The anti-AcK31 and anti-AcK262 Foxp3 Abs were generated in rabbits immunized with chemically synthesized K31 and K262 acetylated peptides (AcK31 peptide, KTAPKAcGSELLC; AcK262 peptide, AHLAGKAcMALAC) in a 77-d rabbit peptide protocol (Covance, Princeton NJ). Abs were purified on affinity columns (Affi-Gel 10 and 15; Bio-Rad, Hercules, CA) loaded with the respective immunogen as described (22). To express wild-type (WT) or 3KR mutant Foxp3 in Jurkat T cells, lentiviral vectors were constructed using pSico-GFP as a backbone (23). The EF-1α promoter was inserted upstream of U6 promoter, and the U6-CMV promoter-EGFP fragment was replaced with either IRES-Thy1.1, WT, or 3KR mutant Foxp3-IRES-Thy1.1 fragments. All clones were fully sequenced. Pseudotyped Foxp3-expressing lentiviral vectors as well as empty control vectors were prepared in 293T cells and used in infections of Jurkat T cells as described (19). Four days postinfection, Jurkat T cells (102) were treated with cycloheximide (CHX; 12.5 μM) and incubated for 2, 4, or 6 h. Foxp3 expression was measured from infected cells by intracellular staining using anti–Foxp3-allophycocyanin Abs (eBioscience, San Diego, CA) after surface staining with anti–Thy1.1-PE Ab. Thy1.1+ cells were gated, and mean fluorescence intensity (MFI) values of Foxp3 were measured using the FlowJo program (Tristar, Phoenix, AZ). The open reading frames corresponding to WT and 3KR mutant Foxp3 were inserted upstream of the IRES into the MSCV-IRES-Thy1.1 vector, which is an MSCV-based retroviral vector that expresses Thy1.1 as a surface marker. To obtain recombinant virus, 10 μg each construct or empty control vector was transfected into phoenix-eco cells, a retroviral packaging cell line derived from 293T cells. The supernatants were collected 48 h after transfection and filtered through a 0.45-μm membrane. Naive CD4+ T cells (>97% purity) isolated from spleen and lymph nodes (SP/LN) of C57BL/6 mice were activated with anti-CD3/CD28 Abs for 24 h. Activated T cells were infected with retroviral supernatants in the presence of polybrene (6 μg/ml) by spinoculation and further activated with anti-CD3/CD28 Abs and recombinant human IL-2 (rhIL-2; 100 U/ml) for 5 d. Cells were stained with anti-CD4, anti-CD25, anti–CTLA-4, and anti-Thy1.1 Abs for surface staining as well anti–Foxp3-PE Ab for intracellular staining (eBioscience). For staining of cytokine-secreting cells, infected cells were further activated with PMA (50 ng/ml; Sigma-Aldrich, St. Louis, MO) and ionomycin (1 μM; Sigma-Aldrich) for 4 h in the presence of brefeldin A (Sigma-Aldrich). Cells were fixed, permeabilized, and stained with PE-conjugated Abs against IL-2, IL-10, and IL-13 (all from eBioscience). For suppression assays, Thy1.1+ T cells were positively isolated using anti–Thy1.1-PE and anti-PE Microbeads (Miltenyi Biotec, Bergisch Gladbach, Germany) and further sorted by FACSAria III (BD Biosciences) with 98% purity. Naive CD4+ T cells (>97% purity) were isolated from SP/LN of Boy/J mice as responder T cells and labeled with CFSE (Invitrogen, Grand Island, NY). A total of 50,000 sorted Thy1.1+ cells were cocultured with 50,000 responder T cells (1:1 ratio) in a 96-well round-bottom plate in the presence of anti-CD3/CD28 Abs and rhIL-2 (100 U/ml) for 3 d. Cells were then stained with anti-CD4 and anti-CD45.1 and analyzed by FACS. All animal studies have been reviewed and approved by the University of California, San Francisco, Institutional Animal Care and Use Committee. Naive T cells (CD4+CD25−CD69−CD44−) were isolated from SP/LN of mice by depletion of non-CD4+ T cells with the CD4+ T Cell Isolation Kit (Miltenyi Biotec) and subsequent depletion of CD4+CD25+CD69+CD44+ T cells by anti–CD25-PE, anti–CD69-PE, anti–CD44-PE, and anti-PE Microbeads (Miltenyi Biotec). Naive CD4+ T cells were differentiated into iTregs with plate-bound anti-CD3 (5 μg/ml), soluble anti-CD28 (2 μg/ml), rhIL-2 (20 U/ml), and TGF-β (2 ng/ml) for 3 or 5 d. In some experiments, CFSE-labeled naive CD4+ T cells were differentiated into iTregs in the presence of different concentrations of TGF-β (0.1–10 ng/ml) to achieve suboptimal conditions for iTreg differentiation for 3 d. To evaluate the effects of SIRT1 inhibition on Treg differentiation, Ex-527 and DMSO were added during iTreg differentiation as indicated. RNA purification, cDNA synthesis, and real-time RT-PCR were performed as described (19). Mouse Foxp3 mRNA was quantified by QuantiTect gene expression assays (Qiagen) with SYBR Green I master mix (MCLab). Relative Foxp3 gene expression ratios between Ex-527–treated and nontreated samples was normalized to GAPDH expression and then calculated by the equation ratio 2−ΔΔCt, comparative cycle threshold method (Applied Biosystems). Real-time RT-PCR analysis was performed in duplicate on three independent samples. 293T cells grown in six-well plates at 70% confluency were cotransfected with expression vectors indicated in the figure legends with Lipofectamine (Invitrogen) or FuGene 6 (Roche). Twenty-four hours after transfection, cells were lysed and processed for coimmunoprecipitation and Western blotting as described (24). Statistical analysis was carried out using paired t tests (significance, p < 0.05). Naive CD4+ T cells isolated from SP/LN of GFP-Foxp3 knockin mice in a C57BL/6 background were differentiated into iTregs as described above. CD4+GFP+ T cells were sorted by FACSAria III (BD Biosciences) with >98% purity. A total of 105 sorted cells were transferred into Boy/J recipient mice as a single retro-orbital injection. DMSO or Ex-527 (40 mg/kg) were injected i.p. into adoptively transferred mice every day for 2 wk. CD4+ T cells were isolated from the draining LN (pancreatic and mesenteric LN) of these mice. To enrich adoptively transferred iTregs (CD4+CD45.2+ T cells), cells from recipient mice (CD4+CD45.1+ T cells) were partially depleted by positive selection after staining cells with anti-CD45.1 Ab. The cells were then stained with anti-CD4, anti-CD45.1, anti-CD45.2, and anti-Foxp3 Abs. Foxp3 expression was analyzed by FACS and the FlowJo program (Tristar). GFP-Foxp3 transgenic mice were used to isolate nTregs (25). CD4+GFP+ cells were sorted from total CD4+ T cells isolated from SP/LN of GFP-Foxp3 knockin mice by FACSAria III high-speed cell sorter (BD Biosciences) with 95% purity. FACS-isolated GFP+ nTregs were plated at 4 × 105 cells/well in a 24-well plate and activated with RPMI complete medium containing rhIL-2 (2000 U/ml) and anti-CD3/CD28–coated microbeads (Invitrogen) at a 2:1 bead/cell ratio. Five days after incubation, cells were treated with either Ex-527 (50 μM) or DMSO and continuously cultured for an additional 2 or 5 d. Foxp3 levels were measured by intracellular staining as described above for GFP+ cells. To map the acetylation sites in Foxp3, we performed mass spectrometry on cellular Foxp3 proteins isolated from 293T cells. Both mouse and human Foxp3 proteins were transiently overexpressed as FLAG-tagged fusion proteins. To enhance acetylation levels, the p300 acetyltransferase was coexpressed, and cells were treated with a combination of TSA and nicotinamide to block class I–III HDACs. Foxp3 was immunoprecipitated using anti-FLAG agarose, eluted with FLAG peptides, and analyzed by mass spectrometry. Peptides recovered in the analysis corresponded to 78 or 82% of human or mouse Foxp3, respectively, and corresponding acetylation sites were identified in both samples. Three acetylated lysines were identified: K31, K262, and K267 in mouse Foxp3 and the corresponding sites K31, K263, and K268 in human Foxp3 (Fig. 1). Identification of acetylation sites in Foxp3 by mass spectrometry. Sequence of murine and human Foxp3. The letters in red indicate the peptides recovered by mass spectrometry. Boxed residues mark acetylated residues identified in the analysis. The underlined regions represent the subdomains of Foxp3 as indicated. Numbers for acetylated lysine residues correspond to mouse Foxp3 protein. *Lysine residues not covered by our analysis. Next, we generated modification-specific Abs against acetylated K31 in mouse Foxp3. Ag-purified Abs were tested in a dot blot analysis; they recognized only the acetylated Ag and did not cross-react with unmodified peptide or acetylated K262 or K267 peptides (Fig. 2A). We then expressed FLAG-Foxp3 or a K31R mutant protein in 293T cells and treated cells with TSA, nicotinamide, or Ex-527, the latter a specific inhibitor of SIRT1 (26). Foxp3 proteins were immunoprecipitated with anti-FLAG agarose, followed by Western blotting with anti-AcK31 Abs. Acetylation at K31 was detected in cells treated with Ex-527 or nicotinamide, but not with TSA, indicating that K31 is a target site of SIRT1 (Fig. 2B, lanes 1–4). No signal was detected in lysates expressing mutant K31R Foxp3, demonstrating the specificity of the antiserum for acetylated Foxp3 in cells (Fig. 2B, lanes 5–8). Similar results were obtained with an antiserum raised against acetylated K262 in Foxp3 (Supplemental Fig. 1A, 1B). Attempts to generate a specific antiserum for acetylated K267 were unsuccessful (not shown). Generation of a modification-specific antiserum against acetylated Foxp3. (A) Dot blotting of acetylated and unacetylated Foxp3 peptides using affinity-purified acetylated K31 Abs (anti-AcK31). Decreasing amounts (1000, 100, and 10 ng) of each peptide were spotted onto nitrocellulose membranes and processed by Western blotting (WB) with anti-AcK31 Ab. (B) Immunoprecipitation (IP)/WB analysis of acetylated FLAG-Foxp3. Expression vectors for WT or K31R mutant FLAG-Foxp3 were transfected into 293T cells, which were subsequently treated overnight with Ex-527 (50 μM), an inhibitor of SIRT1; nicotinamide (5 mM), an inhibitor of sirtuins; and TSA (400 nM), an inhibitor of class I and II HDACs. IPs were performed with anti-FLAG agarose followed by WB with anti-AcK31 Foxp3 and anti-FLAG Abs. (C) Same procedure as in (B) performed in Jurkat T cells infected at a high multiplicity of infection with lentiviral vectors expressing FLAG-tagged WT or 3KR mutant Foxp3. Four days postinfection, cells were treated as in (B). (D) Same procedure as in (B) performed in 293T cells after cotransfection of expression vectors for FLAG-tagged WT or 3KR mutant Foxp3 together with p300, SIRT1, and Tip60. One representative of three independent experiments is shown. Similar results were obtained in Jurkat T cells infected with lentiviral vectors expressing WT Foxp3 or a mutant protein in which all three acetylation sites were replaced by arginines (3KR). Acetylation of K31 was robustly induced in response to treatment with Ex-527 or nicotinamide in WT Foxp3-expressing cells (Fig. 2C, lanes 1–4), whereas only background signal was detected in lysates expressing the 3KR mutant (Fig. 2C, lanes 5–8). No effect was observed after TSA treatment, indicating that K31 is deacetylated by SIRT1 in T cells. 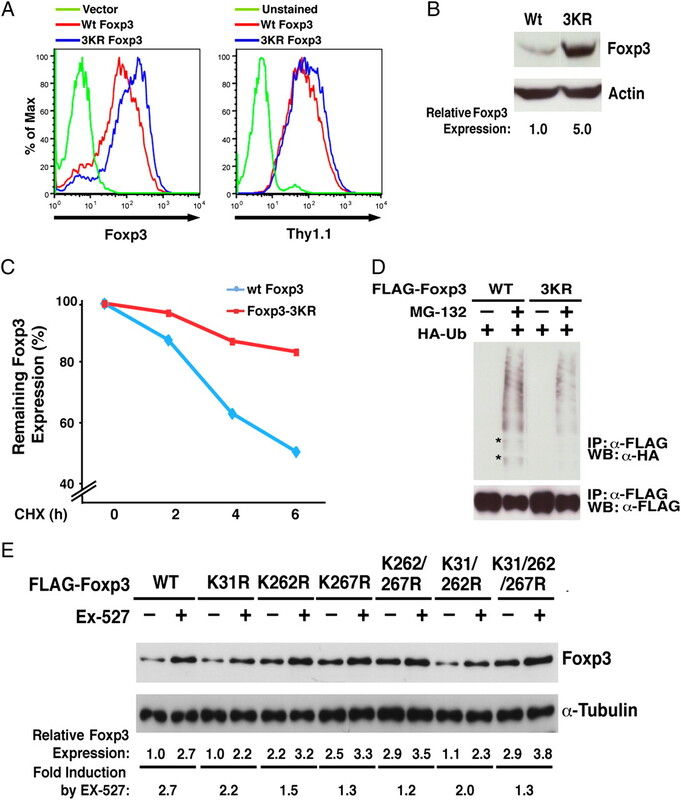 To determine which acetyltransferase enzyme acetylates K31 in cells, we coexpressed FLAG-Foxp3 or 3KR mutant Foxp3 in 293T cells together with p300 and Tip60, two acetyltransferases previously implicated in Foxp3 acetylation (11, 13, 14). Acetylation of K31 in Foxp3 was enhanced by coexpression of p300, but not by Tip60, pointing to p300 as the K31 acetyltransferase in cells (Fig. 2D, lanes 3 and 4). Coexpression of SIRT1 decreased p300-induced acetylation of K31 (Fig. 2D, lane 5), whereas no acetylation was observed in 3KR-expressing cells, as expected (Fig. 2D, lanes 7–12). Similar results were obtained when K262 acetylation was analyzed, indicating that p300 and SIRT1 acetylate and deacetylate these two sites in Foxp3, respectively (Supplemental Fig. 1C). Our data identify three new acetylation sites in Foxp3: K31, K262, and K267. 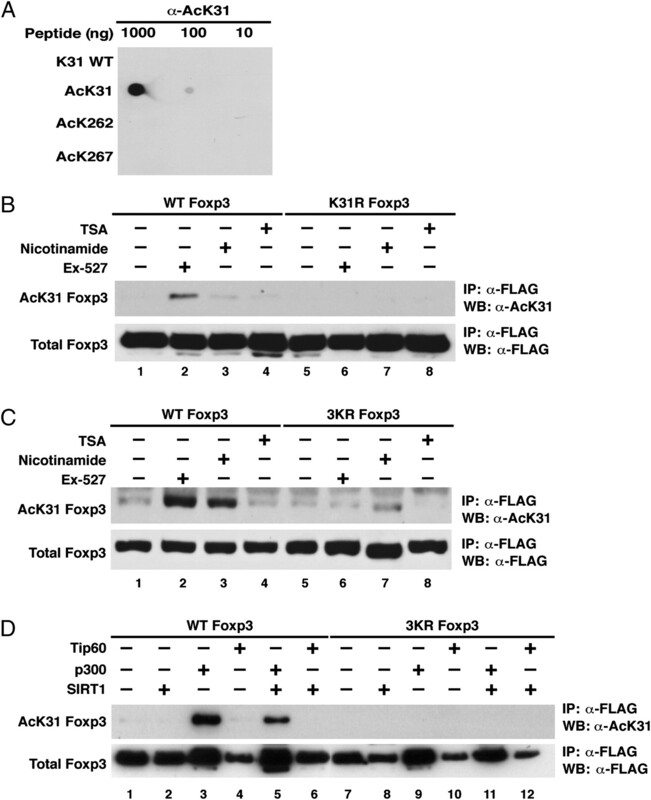 Acetylation of K31 and K262 was confirmed by modification-specific Abs for Foxp3 and is regulated by p300 and SIRT1. Notably, two of the newly identified sites, K262 and K267, are located close to a C-terminal SIRT1-binding region in Foxp3 (aa 279–337) that we identified in coimmunoprecipitation experiments (Supplemental Fig. 2). Next, we examined physiological acetylation levels of Foxp3 in iTreg cultures. iTregs were ex vivo differentiated from naive CD4+ T cells in the presence of anti-CD3/CD28 Abs and TGF-β as described (27). At different time points during the differentiation process, samples of the T cells were harvested, and endogenous Foxp3 protein was immunoprecipitated and subjected to Western blotting with anti-AcK31 and Foxp3 Abs. Foxp3 expression was detected after 24 h of differentiation and peaked at 72–96 h (Fig. 3A). Acetylation of K31 was detected at 72 and 96 h, coinciding with maximal cellular Foxp3 accumulation (Fig. 3A). At 120 h, acetylation of K31 disappeared, but was rescued by treatment with Ex-527 (Fig. 3B). These data demonstrate physiological acetylation of K31 in Tregs and underscore the critical role of SIRT1 in Foxp3 deacetylation. The acetylation level of Foxp3 is regulated in iTregs. (A) Immunoprecipitation (IP)/Western blot (WB) analysis of endogenous acetylated Foxp3 in iTregs. Mouse iTregs were differentiated from naive CD4+ T cells as described in Materials and Methods. Cells were harvested at the indicated time points and subjected to immunoprecipitation with anti-mouse Foxp3 Abs and analyzed by WB with anti-Foxp3 and anti-AcK31 Foxp3 Abs. The arrow points to acetylated Foxp3. *Indicates nonspecific bands. (B) iTregs were differentiated for 120 h and treated with Ex-527 (50 μM) overnight. Data are representative of two independent experiments. We were intrigued by the finding that Foxp3 acetylation and Foxp3 levels correlated in differentiating iTregs. In addition, we noticed in the experiments depicted in Fig. 2 that the 3KR mutant protein accumulated to higher levels than the WT protein. Protein levels of WT and mutant Foxp3 were equalized in these experiments to allow proper assessment of acetylation. We speculated that the newly identified acetylation sites may be subject to an acetylation/ubiquitinylation switch as described for PER2, BAML1, and τ proteins (28–30) as well as recently for Foxp3 (13). These studies showed that acetylation and ubiquitinylation target the same lysine residue, whereby acetylation blocks ubiquitinylation and prevents protein degradation. Conversely, deacetylation of lysine residues enhances their susceptibility to ubiquitinylation, leading to accelerated protein degradation. Mutation of such lysine residue prevents both acetylation and ubiquitinylation and may result in a paradoxical increase in protein stability. To test the hypothesis that the three lysines are involved in Foxp3 protein stabilization, we quantified protein expression of WT and 3KR mutant Foxp3 proteins in infected Jurkat T cells by intracellular staining and flow cytometry. Levels of Foxp3 protein per cell (measured as MFI) were ∼2-fold increased in cells expressing the 3KR mutant as compared with WT Foxp3 (Fig. 4A). This corresponded to an ∼5-fold increase in protein expression measured by Western blotting (Fig. 4B). Because cells were infected with a bicistronic vector simultaneously expressing Foxp3 and the Thy1.1 surface marker from the same mRNA, we also measured Thy1.1 surface levels by flow cytometry. MFI values of Thy1.1 were unchanged in cells expressing WT or mutant Foxp3, supporting the model that changes in Foxp3 expression occurred at a posttranscriptional level (Fig. 4A). SIRT1 destabilizes Foxp3 protein through deacetylation of three newly identified acetylation sites. (A) Intracellular staining of WT and 3KR mutant Foxp3 proteins expressed in Jurkat T cells after lentiviral transduction. Four days postinfection, Foxp3 was measured by intracellular staining using anti–Foxp3-allophycocyanin Ab after staining of cell-surface Thy1.1 using anti–Thy1.1-PE Ab. Data are representative of three independent experiments in which infection efficiencies ranged from 85–95%, as measured by Thy1.1+ cells. (B) Western blot analysis of Foxp3 in Jurkat T cell lysates from (A) with anti-Foxp3 and anti-actin Abs. (C) Pulse-chase experiment in Jurkat T cells infected with lentiviral vectors expressing WT or 3KR mutant Foxp3 along with Thy1.1. Four days postinfection, infected cells were treated with CHX (12.5 μM) for 2, 4, or 6 h. Foxp3 protein expression was measured by intracellular staining using anti–Foxp3-allophycocyanin Abs after staining of cell-surface Thy1.1 using anti–Thy1.1-PE. The MFI values of Foxp3 were measured in Thy1.1+ populations. Data are presented relative to MFI values obtained in cells without CHX (100%). (D) 3KR mutant Foxp3 protein is less ubiquitinylated. Expression vectors for WT and 3KR Foxp3 were cotransfected with hemagglutinin-ubiquitin (HA-Ub) into 293T cells. Sixteen hours after transfection, cells were treated with MG-132 (10 μM), a proteasome inhibitor, for 4 h. Foxp3 proteins were immunoprecipitated with anti-FLAG agarose followed by Western blotting with anti-HA (ubiquitin) and anti-FLAG (Foxp3) Abs. Some ubiquitinylated bands that were underrepresented in cells expressing the 3KR mutant are highlighted by *. (E) Western blot analysis of WT or mutant FLAG-Foxp3 proteins in 293T cell lysates treated with Ex-527 (50 μM) or DMSO as a control with anti-FLAG and anti-tubulin Abs. One representative experiment of four independent experiments is shown. This model was further confirmed when we measured the t1/2 of WT and 3KR mutant proteins in Jurkat cells. Although 50% of WT Foxp3 protein was degraded after 6 h (t1/2 = 6 h), 80% of 3KR mutant protein remained in cells at that time (Fig. 4C). Consistent with the hypothesis that the three lysines are also subject to ubiquitinylation, the 3KR mutant was less ubiquitinylated in cells than WT Foxp3 (Fig. 4D). These data demonstrate that the three newly identified lysines function as targets for the described acetylation/ubiquitinylation switch in Foxp3. To study the role of SIRT1 in this process, we treated 293T cells transiently expressing a series of mutant Foxp3 proteins with Ex-527. Ex-527 increased expression of WT Foxp3 protein by 2.7-fold, supporting the model that hyperacetylation induced by SIRT1 inhibition stabilized Foxp3 (Fig. 4E, WT). The 3KR mutant Foxp3 protein showed an ∼3-fold increase in basal expression in this experiment; expression only increased by 1.3-fold in response to Ex-527 treatment, consistent with the notion that these sites are major SIRT1 deacetylation sites in Foxp3 (Fig. 4E, rightmost two lanes). Expression of Foxp3 was also increased when single mutations were introduced at positions 262 and 267, and the double mutation reached similar expression levels as the 3KR mutant, pointing to these two sites as the main residues involved in the stabilization of Foxp3 (Fig. 4E). Of note, expression levels of the K31 single mutant protein varied; in half of the experiments, no changes were observed as depicted in the figure, whereas in the other half, a 2-fold increase was observed (not shown). To examine the influence of the three sites on Foxp3-suppressive activity, primary CD4+ T cells were purified from mice and transduced with lentiviral vectors expressing WT or 3KR mutant Foxp3. Thy1.1 was bicistronically coexpressed along with Foxp3, and control cells were transduced with vectors expressing Thy1.1 alone. The 3KR mutant accumulated to higher levels than WT protein within CD4+ T cells as shown by intracellular staining and flow cytometry of Thy1.1+ cell populations (Fig. 5A). Similarly, the MFI of CD25 and CTLA-4, two characteristic Treg-associated cell-surface markers, was increased in cells expressing 3KR mutant Foxp3 (Fig. 5A). Infected cells were also activated with a combination of phorbol esters and ionomycin, and intracellular staining for several cytokines associated with Treg function was performed. The secretion of IL-2 and IL-13 was more potently suppressed in cells expressing the 3KR mutant than in WT Foxp3-expressing cells, pointing to increased suppressive activity of the 3KR mutant (Fig. 5B). In agreement with this model, more IL-10–producing cells were detected in cell populations transduced with the 3KR mutant (Fig. 5B). The suppressive function of Foxp3 is enhanced by the 3KR mutation. (A) Flow cytometric analysis (MFI) of Foxp3, CD25, and intracellular CTLA-4 in murine CD4+ T cells transduced with retroviral vectors expressing WT or 3KR mutant Foxp3. (B) Flow cytometric analysis (%) of cytokine-secreting cells from transduced T cells after activation with anti-CD3/CD28 Abs. Data in (A) and (B) represent the average (mean ± SEM) of three independent experiments. (C) Suppression assays of WT Foxp3 or the 3KR mutant. Naive mouse CD4+ T cells were infected with retroviral vectors expressing WT Foxp3 or the 3KR mutant along with control retrovirus after activation by anti-CD3/CD28 Ab for 24 h as above. Infected cells were sorted and cocultured with CFSE-labeled responder T cells for 3 d. Proliferation of responder T cells was assessed by CFSE dilution within the responder T cell population. The left panel shows one representative FACS plot. The proliferating cells were presented as cells having divided more than three cycles. The right panel shows data represented as the mean ± SEM of five independent experiments. To test the suppressive activity of these cells directly, Thy1.1+ cells were sorted from infected T cell cultures and cocultured with CFSE-labeled CD4+ effector T cells. Cells expressing the 3KR mutant inhibited the proliferation of responder T cells more potently than cells expressing WT Foxp3 or vector-transduced cells, as shown by a lack of dilution of the CFSE fluorescent marker (Fig. 5C). These data indicate that enhanced expression of 3KR mutant Foxp3 correlates with better suppressive function of T cells expressing this protein. We speculated that these observations may have therapeutic relevance and that hyperacetylation of Foxp3 may increase the yield and stability of Foxp3-expressing T cells generated ex vivo. Naive CD4+ T cells were isolated from mouse SP/LN and activated with anti-CD3/CD28 Abs in the presence of IL-2 and increasing amounts of TGF-β to differentiate them into iTregs. Addition of Ex-527 increased the number of Foxp3-expressing iTregs even in the absence of exogenous TGF-β (Fig. 6A). Furthermore, Ex-527 synergized with low concentrations of exogenous TGF-β (0.1 and 0.5 ng/ml) to induce differentiation of iTregs. A synergy with Ex-527 was no longer observed at higher concentrations of TGF-β. No effect of Ex-527 was observed on cell proliferation as measured by CFSE labeling, except in cells cotreated with TGF-β at concentrations >1 ng/ml (Fig. 6A). Similar results were obtained when iTreg differentiation was induced in the absence of IL-2 (data not shown). Inhibition of SIRT1 activity by Ex-527 promotes differentiation of iTregs. (A) Intracellular flow cytometric analysis of Foxp3 expression in iTregs differentiated at indicated concentrations of TGF-β in the presence and the absence of Ex-527 (50 μM). One experiment performed in triplicate is shown. (B) Intracellular flow cytometric analysis of Foxp3+ cells and MFI of intracellular Foxp3 in iTregs after treatment with Ex-527 (50 μM) or DMSO control during differentiation from naive T cells. (C) Real-time RT-PCR analysis of Foxp3 mRNA levels in iTregs described in (B). Data in (B) and (C) are presented as fold induction by Ex-527 treatment relative to DMSO vehicle (100%). The averages (mean ± SD) of three independent experiments are shown. The increased yield of Foxp3-expressing T cells was accompanied by an increase in the expression level of Foxp3 (MFI), supporting the model that hyperacetylation induced by Ex-527 stabilizes Foxp3 protein in iTregs (Fig. 6B). However, we also measured a slight increase in Foxp3 mRNA levels, pointing to an additional transcriptional effect of Ex-527 during iTreg differentiation (Fig. 6C). To examine the effect of Ex-527 in vivo, we performed adoptive transfer experiments of iTregs into mice. iTregs were generated from CD4+ T cells isolated from Foxp3-GFP knockin mice. This mouse line expresses a fusion protein composed of Foxp3 and GFP from the endogenous Foxp3 promoter, and Foxp3 expression can be monitored by flow cytometry of GFP in live cells (25). GFP+ cells were sorted after differentiation in vitro and transferred into Boy/J recipient mice by retro-orbital injection. Mice were treated with either Ex-527 or carrier control by i.p. injection for 2 wk. CD4+ T cells were isolated from pancreatic and mesenteric LN of Boy/J mice, and Foxp3 expression was analyzed by intracellular Foxp3 staining in recipient and donor Treg populations with different CD45 allele markers. After 2 wk, only 50% of transferred iTregs still expressed Foxp3 in control mice as compared with 90% in mice treated with Ex-527 (Fig. 7A, bottom panel). The MFI of Foxp3 was markedly higher in Tregs isolated from Ex-527–treated mice as compared with control-treated littermates (MFI 463 versus 122). Ex-527 also increased the MFI of Foxp3 in Tregs isolated from recipient Boy/J mice (MFI 419 versus 205); however, no change in total Treg numbers was noted in recipient mice (Fig. 7A, top panel). These results indicate that inhibition of SIRT1 deacetylase activity by Ex-527 prevents the loss of Foxp3 protein and increases the stability of iTregs in vivo. Ex-527 promotes the stability of iTregs in vivo and nTregs ex vivo. (A) Flow cytometric analysis of CD4 and Foxp3 (percent in black and MFI in gray) in Tregs isolated from the draining LN of Boy/J mice 2 wk after adoptive transfer. Highly sorted iTregs differentiated in vitro from naive CD4+ T cells were transferred into Boy/J mice by retro-orbital injection. DMSO and Ex-527 were injected i.p. into these mice every day for 2 wk. The data show one representative experiment of three independent experiments with similar results. (B) The left panel shows flow cytometric analysis of GFP in nTregs isolated from GFP-Foxp3 knockin mice after ex vivo expansion with or without DMSO. The right panel shows Western blot analysis of Foxp3 in cell lysates from GFP− and GFP+ cultures before and after expansion. We show one representative experiment of two independent experiments with similar results. (C) Model of how inhibition of SIRT1 deacetylase activity by Ex-527 increases the acetylation at three newly identified lysine residues in Foxp3 and promotes Treg differentiation and stability. See text for details. Finally, we tested the effect of Ex-527 on the stability of nTregs during ex vivo expansion. Total CD4+ T cells were isolated from SP/LN of GFP-Foxp3 knockin mice, and GFP+ nTregs were sorted with >95% purity. GFP+ cells were cultured in the presence of anti-CD3/CD28 beads and IL-2 for 5 d when Ex-527 or carrier control was added. Two days later, 75% of cells were GFP+ regardless of whether Ex-527 was added or not; however, the MFI of GFP was increased in Ex-527–treated cells, pointing to stabilization of Foxp3 protein levels in the absence of SIRT1 activity (Fig. 7B, Day 7). At day 12 postisolation, only 5% of cells remained GFP+ in control-treated cells versus 45% in Ex-527–treated cultures (Fig. 7B, Day 12). The level of Foxp3 expression remained higher in Ex-527–treated versus control-treated cells by flow cytometry (MFI = 387 versus 263) and in Western blot analysis (Fig. 7B, right panel). These data underscore the negative role of the SIRT1 deacetylase activity on Foxp3 expression in the natural context of iTregs or nTregs. Our study identifies three novel acetylation sites in Foxp3 that regulate expression of the Foxp3 protein in iTregs and nTregs. The three sites are targeted by the SIRT1 deacetylase, a process that destabilizes Foxp3 expression (Fig. 7C). Paradoxically, 3KR mutant Foxp3, which cannot be acetylated, accumulates to higher levels than WT Foxp3 in CD4+ T cells and confers better suppressive activity to T cells than the WT protein. These data fit with a proposed acetylation/ubiquitinylation switch in Foxp3, where acetylation and mutation of the acetylated residues both exert a positive effect on protein stability and function (13, 28–30). Accordingly, hyperacetylation induced by Ex-527, a small-molecule inhibitor of SIRT1, stabilizes cellular Foxp3 expression and promotes in vitro differentiation and in vivo stability of iTregs as well as maintenance of Foxp3 in nTregs during ex vivo expansion (Fig. 7C). One of our most striking findings is that Ex-527 can replace or synergize with low doses of TGF-β in the in vitro generation and in the in vivo maintenance of iTregs (Fig. 6A). These data uncover a novel role of SIRT1 in iTreg differentiation. The cooperative effects of Ex-527 with TCR/TGF-β signaling on iTreg differentiation are comparable to the effects of all-trans retinoic acid, a well-established enhancer of iTreg generation (31–37). 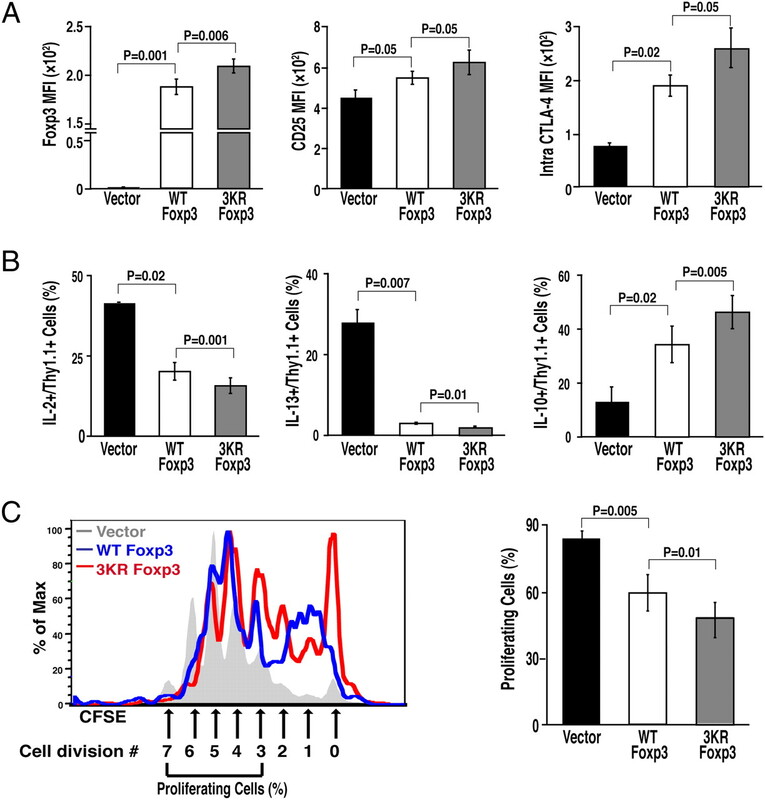 Although all-trans retinoic acid enhances Foxp3 expression in iTregs through multiple mechanisms including transcriptional regulation of the Foxp3 promoter, enhancement of TCR/TGF-β signaling, and indirect effects by modulating the function of APCs, our combined data point to a major effect of Ex-527 in the stabilization of Foxp3 protein through hyperacetylation at the three newly defined lysines. However, we also observed a small but reproducible increase in Foxp3 mRNA levels in response to Ex-527 in iTregs. This may result from hyperacetylation of other transcriptional regulators involved in Foxp3 gene activation in these cells. p65/RelA, a subunit of the NF-κB transcription factor as well as Foxo transcription factors, and Smad3 proteins are substrates of SIRT1 (38–41) and activate Foxp3 transcription in response to TCR/TGF-β signaling (5, 42, 43). Therefore, Ex-527 may activate Foxp3 transcription through p65/RelA, Foxo, or Smad3 acetylation during in vitro differentiation of iTregs. In addition, Foxp3 protein stabilized by Ex-527 may promote its own transcription through a positive feed-forward regulatory loop (5, 44, 45). Published results indicate that acetylation regulates the transcriptional activity of Foxp3 (i.e., by regulating the DNA-binding affinity of Foxp3) (10–12). Our results point to a major function of acetylation in regulating the stability of the Foxp3 protein. It is striking that both the hyperacetylated and acetylation-deficient Foxp3 proteins accumulate to higher levels in cells and that the 3KR mutant shows enhanced transcriptional activity on target genes, such as IL-2 and IL-10. Our data showing that mutant Foxp3 has higher suppressive activity than WT protein argue against an additional positive transcriptional effect of Foxp3 acetylation at these three sites. A positive transcriptional effect would likely be abrogated by the lysine-to-arginine mutations and would result in a decrease in Treg-suppressive functions. Instead, suppressive functions were enhanced, indicating that stabilization of Foxp3 may be the major effect of lysine acetylation at the three sites. Although many reports have demonstrated that Tregs expressing low levels of Foxp3 protein or Ex-Tregs have pathogenic effects in the immune system (6, 9, 46–49), molecular mechanisms underlying the downregulation of Foxp3 expression are poorly understood. Interestingly, Foxp3 mRNA is expressed at similar levels in human Tregs expressing Foxp3 at low and high levels, indicating that regulation of FoxP3 expression may occur at the posttranscriptional level (48). Our findings that SIRT1 negatively regulates the stability of Foxp3 expression through deacetylation of three lysine residues support a model whereby downregulation of Foxp3 expression is regulated in part at the posttranscriptional level. Elevated cellular expression or selective activation of the deacetylase activity of SIRT1 during inflammatory responses could lead to enhanced deacetylation and destabilization of Foxp3 followed by conversion of Foxp3+ Tregs into Foxp3− or Foxp3low Tregs. Although our data provide robust evidence for the presence and functional relevance of the three newly described acetylation sites in Foxp3, it remains unclear how many other acetylation sites exist in Foxp3. Tip60 acetylates K8 in human FoxP3 (50). In addition, TSA treatment was shown to change the acetylation levels of K8, K382, and K393 in Foxp3 (10). Our analysis did not recover any peptides containing these acetylated lysines, indicating that different acetyltransferases may target different lysines in Foxp3, possibly under different biological circumstances. Our observation that Ex-527 enhances Foxp3 expression during ex vivo Treg expansion may be relevant to ongoing efforts to enhance Foxp3 expression in therapeutic ex vivo approaches to allograft rejection or autoimmune diseases (2, 7, 47, 51, 52). A recent publication showed that i.p. injection of Ex-527 in mice prolonged allograft survival, supporting the model that Ex-527 treatment is enhancing Treg activity in vivo (15). In addition, administration of Ex-527 may render infused Tregs more resistant to conversion into effector T cells during adoptive Treg therapy and boost endogenous iTreg generation by synergizing with natural TGF-β present within chronically inflamed tissues or transplanted tissues (4). Future studies will evaluate the potential of SIRT1 inhibitors in in vivo and ex vivo Treg-based therapeutic applications in autoimmune diseases or graft rejections. We thank Drs. S. Sakaguchi, T. Jacks, and J. Bluestone for sharing important reagents, Ruth Getachew for technical assistance, Lukas Jerker for helpful discussions, and Veronica Fonseca for administrative assistance. We thank Andy, Sara, Ken, and Meg Kurtzig and Leslie Mulholland for generous support of the work. M.O. is supported by grants from the Gladstone Institute, Sandler Foundation/University of California, San Francisco, and the National Institutes of Health (R01 AI081651).
. 2010. Th17 and regulatory T cells in mediating and restraining inflammation. Cell 140: 845–858.
. 2009. Natural and adaptive foxp3+ regulatory T cells: more of the same or a division of labor? Immunity 30: 626–635.
. 2009. Control of regulatory T cell lineage commitment and maintenance. Immunity 30: 616–625.
. 2009. Epigenetic mechanisms of regulation of Foxp3 expression. Blood 114: 3727–3735.
. 2007. Deacetylase inhibition promotes the generation and function of regulatory T cells. Nat. Med. 13: 1299–1307.
. 2007. FOXP3 interactions with histone acetyltransferase and class II histone deacetylases are required for repression. Proc. Natl. Acad. Sci. USA 104: 4571–4576.
. 2008. TGF-beta and IL-6 signals modulate chromatin binding and promoter occupancy by acetylated FOXP3. Proc. Natl. Acad. Sci. USA 105: 14023–14027.
. 2010. Regulation of Treg functionality by acetylation-mediated Foxp3 protein stabilization. Blood 115: 965–974.
. 2011. Rapid temporal control of Foxp3 protein degradation by sirtuin-1. PLoS ONE 6: e19047.
. 2011. Sirtuin-1 targeting promotes Foxp3+ T-regulatory cell function and prolongs allograft survival. Mol. Cell. Biol. 31: 1022–1029.
. 2006. The biochemistry of sirtuins. Annu. Rev. Biochem. 75: 435–465.
. 2010. Protein deacetylation by SIRT1: an emerging key post-translational modification in metabolic regulation. Pharmacol. Res. 62: 35–41.
. 2008. The ups and downs of SIRT1. Trends Biochem. Sci. 33: 517–525.
. 2008. Human immunodeficiency virus type 1 Tat protein inhibits the SIRT1 deacetylase and induces T cell hyperactivation. Cell Host Microbe 3: 158–167.
. 2009. The type III histone deacetylase Sirt1 is essential for maintenance of T cell tolerance in mice. J. Clin. Invest. 119: 3048–3058.
. 2006. In-gel digestion for mass spectrometric characterization of proteins and proteomes. Nat. Protoc. 1: 2856–2860.
. 2011. Characterization of HIV Tat modifications using novel methyl-lysine-specific antibodies. Methods 53: 91–96.
. 2004. Cre-lox-regulated conditional RNA interference from transgenes. Proc. Natl. Acad. Sci. USA 101: 10380–10385.
. 2005. SIRT1 regulates HIV transcription via Tat deacetylation. PLoS Biol. 3: e41.
. 2005. Regulatory T cell lineage specification by the forkhead transcription factor foxp3. Immunity 22: 329–341.
. 2005. Discovery of indoles as potent and selective inhibitors of the deacetylase SIRT1. J. Med. Chem. 48: 8045–8054.
. 2003. 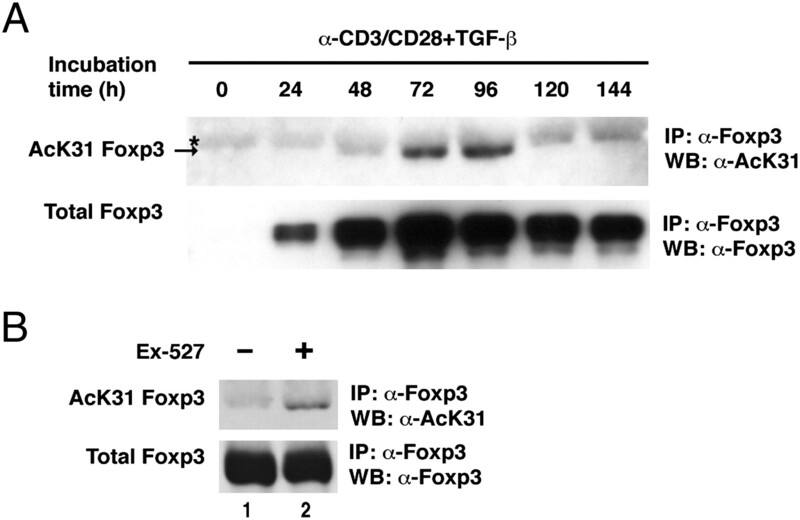 Conversion of peripheral CD4+CD25- naive T cells to CD4+CD25+ regulatory T cells by TGF-beta induction of transcription factor Foxp3. J. Exp. Med. 198: 1875–1886.
. 2008. SIRT1 regulates circadian clock gene expression through PER2 deacetylation. Cell 134: 317–328.
. 2008. The NAD+-dependent deacetylase SIRT1 modulates CLOCK-mediated chromatin remodeling and circadian control. Cell 134: 329–340.
. 2010. Acetylation of tau inhibits its degradation and contributes to tauopathy. Neuron 67: 953–966.
. 2007. All-trans retinoic acid mediates enhanced T reg cell growth, differentiation, and gut homing in the face of high levels of co-stimulation. J. Exp. Med. 204: 1765–1774.
. 2007. Small intestine lamina propria dendritic cells promote de novo generation of Foxp3 T reg cells via retinoic acid. J. Exp. Med. 204: 1775–1785.
. 2007. Reciprocal TH17 and regulatory T cell differentiation mediated by retinoic acid. Science 317: 256–260.
. 2007. Vitamin A metabolites induce gut-homing FoxP3+ regulatory T cells. J. Immunol. 179: 3724–3733.
. 2009. Retinoic acid can directly promote TGF-beta-mediated Foxp3(+) Treg cell conversion of naive T cells. Immunity 30: 471–472, author reply 472–473.
. 2010. Positive and negative transcriptional regulation of the Foxp3 gene is mediated by access and binding of the Smad3 protein to enhancer I. Immunity 33: 313–325.
. 2008. Retinoic acid enhances Foxp3 induction indirectly by relieving inhibition from CD4+CD44hi Cells. Immunity 29: 758–770.
. 2004. The interaction between FOXO and SIRT1: tipping the balance towards survival. Trends Cell Biol. 14: 408–412.
. 2007. Dynamic FoxO transcription factors. J. Cell Sci. 120: 2479–2487.
. 2010. Resveratrol inhibits renal fibrosis in the obstructed kidney: potential role in deacetylation of Smad3. Am. J. Pathol. 177: 1065–1071.
. 2009. Development of Foxp3(+) regulatory t cells is driven by the c-Rel enhanceosome. Immunity 31: 932–940.
. 2011. Foxo: in command of T lymphocyte homeostasis and tolerance. Trends Immunol. 32: 26–33.
. 2007. Maintenance of the Foxp3-dependent developmental program in mature regulatory T cells requires continued expression of Foxp3. Nat. Immunol. 8: 277–284.
. 2007. Foxp3-dependent programme of regulatory T-cell differentiation. Nature 445: 771–775.
. 2007. Regulatory T-cell functions are subverted and converted owing to attenuated Foxp3 expression. Nature 445: 766–770.
. 2009. Developmental plasticity of Th17 and Treg cells. Curr. Opin. Immunol. 21: 274–280.
. 2010. Histone acetyltransferase mediated regulation of FOXP3 acetylation and Treg function. Curr. Opin. Immunol. 22: 583–591.
. 2009. Therapeutic approaches to allergy and autoimmunity based on FoxP3+ regulatory T-cell activation and expansion. J. Allergy Clin. Immunol. 123: 749–755, quiz 756–757.